Elizabeth Arthur was born in New York City and has lived in Vermont, Wyoming, British Columbia, and Indiana. She is the author of four novels - Beyond the Mountain, Bad Guys, Binding Spell, and Antarctic Navigation -- as well as two memoirs, Island Sojourn and Looking for the Klondike Stone. 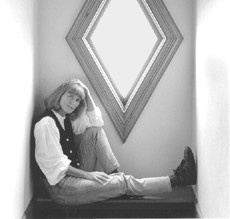 Her work has twice been recognized with fellowships from the National Endowment for the Arts, and in 1990 she was the first novelist selected for participation in the Antarctic Artists and Writers Program, under the auspices of the National Science Foundation. Her vita provides information about her writing; her bio provides information about her life and the lives of the other writers in the family. Arthur's work has been published in Canada and England and translated into German, Spanish, Japanese, and Hungarian.